When you don't have the option of composting in a bin or pile, there are still a few things you can do to make compost and enrich your soil. There's vermicomposting, which allows you to make compost even if you don't have a yard. Then there's trench composting, which is an excellent way to compost food scraps if your community doesn't allow them in traditional compost piles. But trench composting requires a lot of space and is based on plant rotation (so it's not convenient for perennials). Fortunately, there's an even simpler method: the dig and drop. All it takes is a shovel and a small spot of ground. Dig a hole, approximately 10 to 12 inches deep and as wide as you want or need it to be. Drop food scraps or other organic matter into the hole. Replace the soil, and you're done. Dig and Drop composting is a good solution for the busy gardener because you don't have to worry about harvesting the compost. The organic matter breaks down right in the garden, and the resulting compost enriches the soil and provides nutrients to nearby plants. You might find that the easiest way to do this is to collect the food scraps from your kitchen into a bowl or bucket, then go out at the end of the day (or every few days) and bury them in your garden. This way, you don't have to worry about digging large holes; a small hole will accommodate all of the food scraps produced by an average household over a day or more. The dig and drop technique is a simpler and smaller-scale version of trench composting, making it suitable for more situations. The main drawback of trench composting is that it requires an empty spot in the garden. It works very well in vegetable garden beds, either when the season is over or when you're able to carefully dig trenches between rows of veggies. It can also work in beds where you plant only annuals. In the off-season, you are able to compost and enrich the soil, and the plants will grow that much better the following year. However, if there is no "off-season" or you don't have a big, empty garden bed to dig trenches into, trench composting may not feasible or convenient. Dig and drop might be the answer. Because it is contained to small areas, you can compost right next to an individual plant or grouping without disturbing surrounding plants (provided there's a little spacing). This makes dig and drop useful in established perennial gardens or mixed borders. Be careful when digging around plant roots. Try to dig your hole several inches away from the crowns of your plants to ensure that you don't damage the root systems when digging. Bury food scraps deep to deter pests. 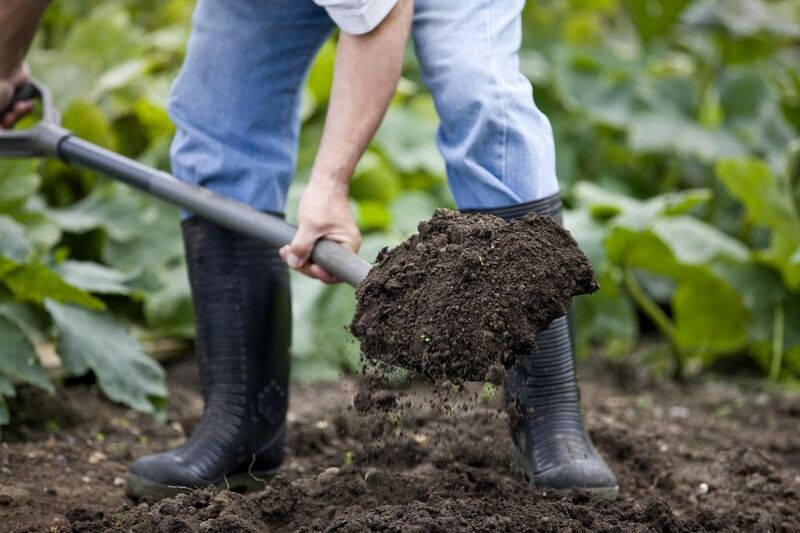 Dig your hole at least 10 inches deep so there is plenty of soil covering the scraps to mask the scent from animals. Don't bury meat or dairy. This is a sure way to entice dogs and rodents into your garden. And you can be sure that a dog will not dig as carefully as you have, possibly damaging your plants. Want to Grow a Compost Pile? Grow These Crops!